The marsupial family Vombatidae comprises three species: the northern hairy nosed (NHN)(Lasiorhinus krefftii), the southern hairy nosed (SHN) (Lasiorhinus latifrons) and the common (Vombatus ursinus). Adult wombats are around 30cm tall, rectangular in shape (80-100cm long) and weigh between 20 – 35kg (Van Dyck & Strahan 2008). I’ve always thought they look more like footstools than most other animals. The shape is not for putting your feet up after a long day though. 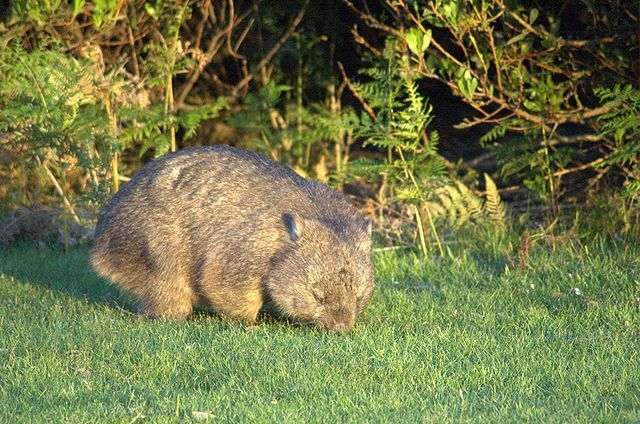 Wombats are burrowing machines, and their squat shape is good for moving through tunnels. They also have extra hard patches on the front of their head and on their rump, to compact earthen burrow walls. Common wombats can excavate living quarters in burrows up to 20m long, which can interconnect with other burrows and have several entry/exit points, AND they can have several of these long burrows throughout their home range (McIlroy 2008). Although wombats have short legs, they can move at up to 40 km/h over short distances if necessary (ref: Australian Museum). Wombats can be aggressive amongst themselves and towards humans, particularly if startled by a person. See here for a story about a wombat attack in 2010. The NHN wombat is highly endangered, with only a few still living in a moderately secret location near Clermont in central Queensland. The SHN wombat is doing comparatively better, spread across the southern coast of South Australia, and the common wombat is, well, common across Tasmania, ACT, and the eastern parts of Victoria, New South Wales and South Australia. Why are wombats so cool? Because they live underground and minimise their exposure to hot daytime temperatures by hanging around in their burrows. They emerge in the evenings to browse on grasses, and have an almost rodent-like dentition as a result of this dietary preference. This lifestyle also means that they have very low energy requirements for an animal of their size. Evans et al. (2003) describe wombats as having an “energetically frugal lifestyle”. The field metabolic rate of a SHN wombat (mean 3,141 kJ/day during the dry season) can be as low as 40% of that expected for a herbivore of wombat size (Evans et al. 2003). They also have very low turnover rates for water, and this combined with their underground lifestyle and slow metabolism means that they are excellent at conserving energy. Which is handy for an animal that, in the case of the SHN wombat, lives in an environment that can be extremely hot and/or dry; and feeds on (often dry) grass of poor nutrition content. What kinds of parasites do ‘energetically frugal footstools’ have? Wombats are hosts to the agriculturally-important trematode Fasciola hepatica. Although not an important reservoir host, common wombats do seem to be adversely affected by pathology of F. hepatica infection (Spratt et al. 2008). Wombats are also host to eight species of cestodes (Spratt et al. 1991) including the anoplocephalid Progamotaenia vombati (formerly known P. festiva in wombats, but found to be a species complex across wombats, wallabies and kangaroos (see Beveridge & Shamsi 2009)). Common wombats are also known to host the taeniid Echinococcus granulosus (also known as hydatids), but not in high prevalence and only recorded from parts of Victoria, which indicates that they are not a major intermediate host (see Jenkins 2006). Wombats are host to 6 species of flea genus Echindophaga. 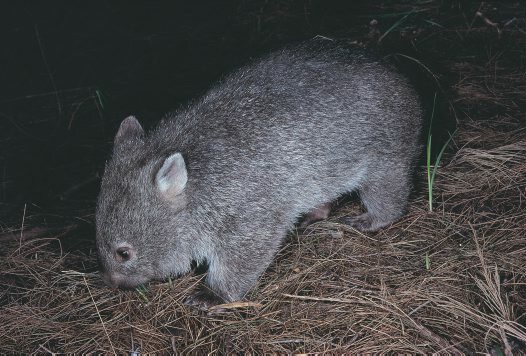 Two species of Lycopsylla – lasiorhini and nova, are known only from wombats (Dunnet & Mardon 1974, Gerhardt et al. 2000). Wombats also host ticks, including the widespread species Ixodes tasmani, I. cornuatus and Amblyomma triguttatum, and Bothriocroton auruginans and I. victoriensis (which are both known as ‘wombat ticks’) (Roberts 1970, Gerhardt et al. 2000). 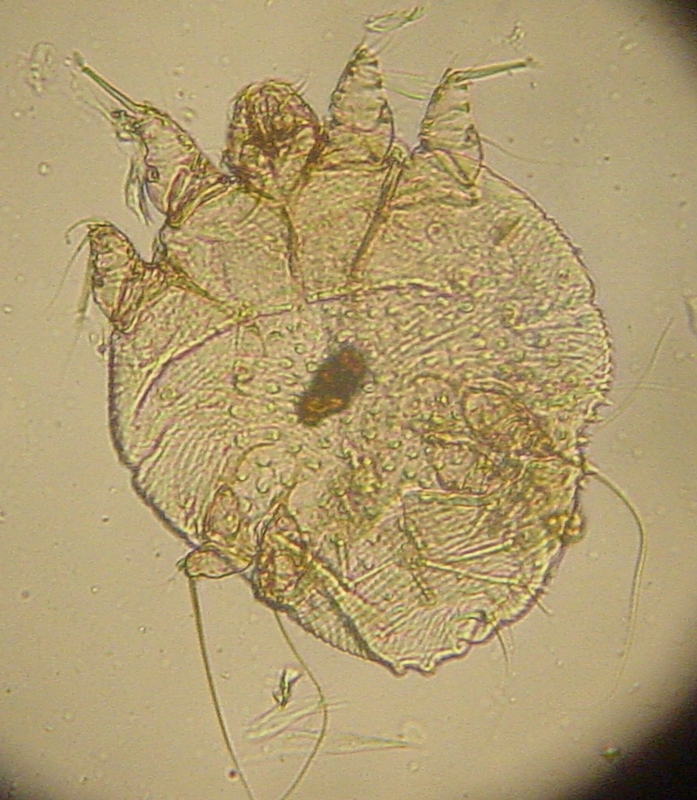 But perhaps the most famous wombat ectoparasite is the astigmatan mite Sarcoptes scabei. Causing the medical (veterinary in this case) condition scabies, this tiny mite has jumped from people to domestic animals to wildlife, and can make life very difficult for affected wombats. Heavy mite infestations can cause hair loss and crusts on the skin of wombats, and can cause severe pathology at the site of infestation, and throughout the body of the affected animal (Skerratt et al. 1999). Wombats with severe infestations can die from a combination of the pathological effects, and from starvation caused by decreased ability to masticate their food, reduced ability to compete with healthy wombats for food, and possibly the increased energy demands caused by the severe infestation (Skerratt et al. 1999). 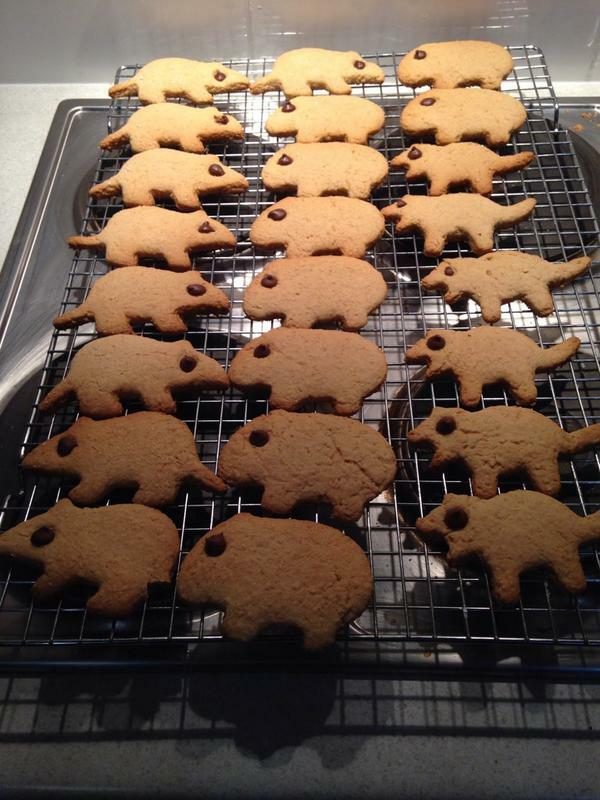 Wombats are good as gingerbread biscuits too. 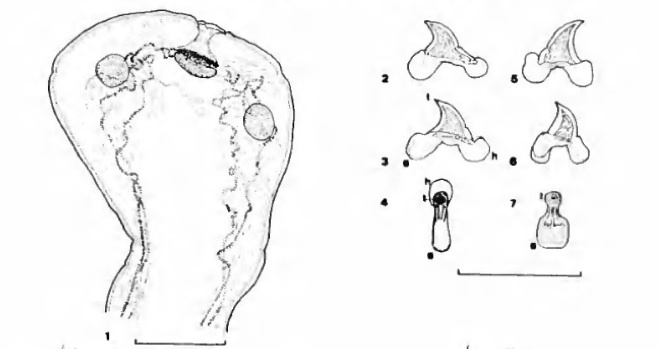 Beveridge I and Shamsi S (2009) Revision of the Progamotaenia festiva species complex (Cestoda: Anoplocephalidae) from Australasian marsupials, with the resurrection of P. fellicola (Nybelin, 1917) comb. nov. Zootaxa 1990, 1-29. Dunnet GM and Mardon DK (1974) A monograph of Australian fleas. Aust J Zool Supp Ser 30. 1-273. Jenkins DJ (2006) Echinococcus granulises in Australia: widespread and doing well. Parasitology International 55, S203-206. McIlroy JC (2008) Common wombat, Vombatus ursinus. In: Mammals of Australia, eds Van Dyck S, Strahan, R. Reed Books, Sydney. Skerratt LF, Middleton D, Beveridge I (1999) Distribution of life cycle stages of Sarcoptes scabei var wombat and effects of severe mange on common wombats in Victoria. J Wildl Dis 35, 633-646. Spratt DM, Beveridge I, Walter EL (1991) A catalogue of Australasian montremes and marsupials and their recorded helminth parasites. Rec S Aust Mus Monogr Ser 1, 1-105. Spratt DM et al. (2008) Guide to the identification of common parasites of Australian mammals. In: Medicine of Australian Mammals, eds Vogelnest L, Woods R. CSIRO Publishing, Melbourne. 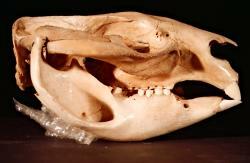 Van Dyck S, and Strahan R (2008) Mammals of Australia. Reed Books, Sydney. Winter can be tough on invertebrates. Even endotherms can find winters a bit grim if it’s extremely cold. Harsh freezing conditions are unforgiving, especially to those who cannot regulate their own body temperature. Parasites that have life stages involving intermediate hosts fare somewhat better than those free-living in the environment. But there is still risk to their survival, especially if the intermediate host is an invertebrate. In this way, the cold winter temperatures regulate the populations of parasites by increasing their mortality. The effects of warmer winters on parasite abundance, and as a consequence, host health, have been known for some time. A neat example of this comes from the Canadian arctic, in the relationship between the nematode Umingmakstrongylus pallikuukensis and its definitive host is the muskox (Ovibos moschatus). The nematode has an intermediate host, usually a slug, where larvae develop to infective stages. When the infective stage nematodes are consumed by a muskox, they take up residence in its lungs. Heavy infections can accumulate as the host gets older, causing serious pathology and can even kill muskox (Kutz et al. 2009). The accumulation was key, because under ‘normal’ (i.e., cold) winter conditions, it takes two years for the nematodes to reach maturity in their intermediate hosts. 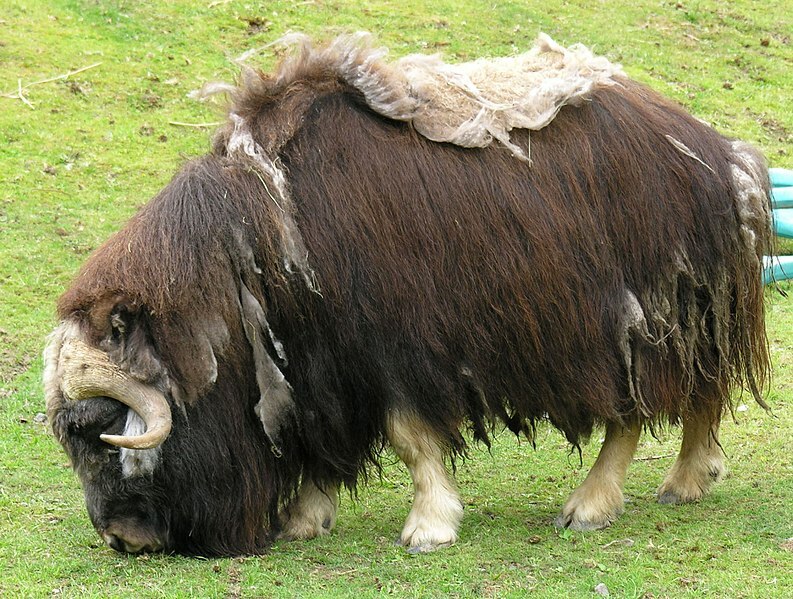 But if it warms up, they can be ready to infect muskox in only one year, without having their development arrested during a winter (Kutz, et al. 2002). This is bad news for the muskox, because it means that far more nematodes will be around at any one time. It’s a tick-infested ghost moose. If this makes you a bit sad, please don’t google ‘ghost moose’ images. Another effect of warmer winters is increased survival of ticks. While not yet present in the Arctic, the winter tick, Dermacentor albipictus, feeds on moose (Alces alces) in parts of southern Canada and the northern United States. Cold winters play a large part in regulating the populations of the ticks, as many larvae perish during winter as they wait for a moose to walk past. The time it takes for females to reach maturity is also thought to be regulated by a combination of time and temperature (Hueffer et al. 2011), meaning that warmer weather will go some way to speeding up the development of the ticks. The ticks stay on their moose hosts for their whole life, feeding and moulting. This means that moose can be subject to thousands of ticks feeding on them continuously from winter to the start of summer. Moose that suffer heavy infestations are called ‘ghost moose’. With up to 400,000 individual ticks feeding on a single individual (Kutz, et al. 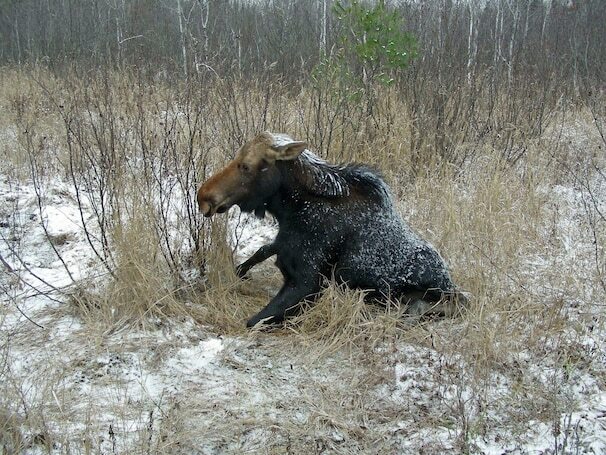 2009), the ghost moose suffer hair loss, anemia, emaciation and secondary infections, and can die. Increased mortality of moose populations in northern US have been linked to increased abundance of ticks (ref Washington Post), which will affect trophic cascades in the boreal forests the moose live. These are just two examples of how parasites interact with their hosts. By adding environmental perturbation (be it climate, urbanisation, habitat loss etc. ), the dynamics of these interactions will change. Distribution changes, host switches, alteration to phenology and emerging pathogens are all on the cards as we hurtle through the 21st century. Kutz et al. (2002) Canadian Journal of Zoology 80, 1977-1985. Kutz et al. (2009) Veterinary Parasitology 163, 217-228. Recently, I went on a little data-collecting trip. The scenery was pretty cool and I was collecting parasites from some rather cute marsupials, so I thought it might be nice to share it with you. 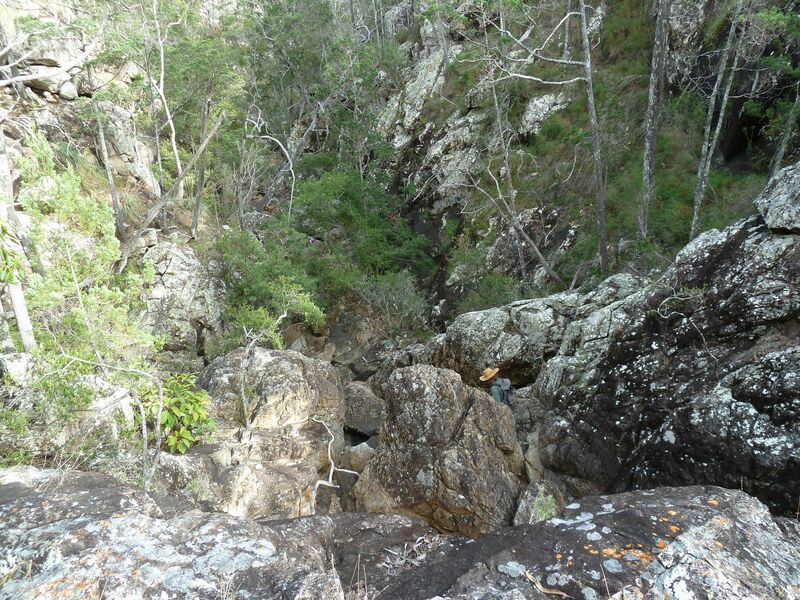 One of our rockier sites – a creek running through a gorge. 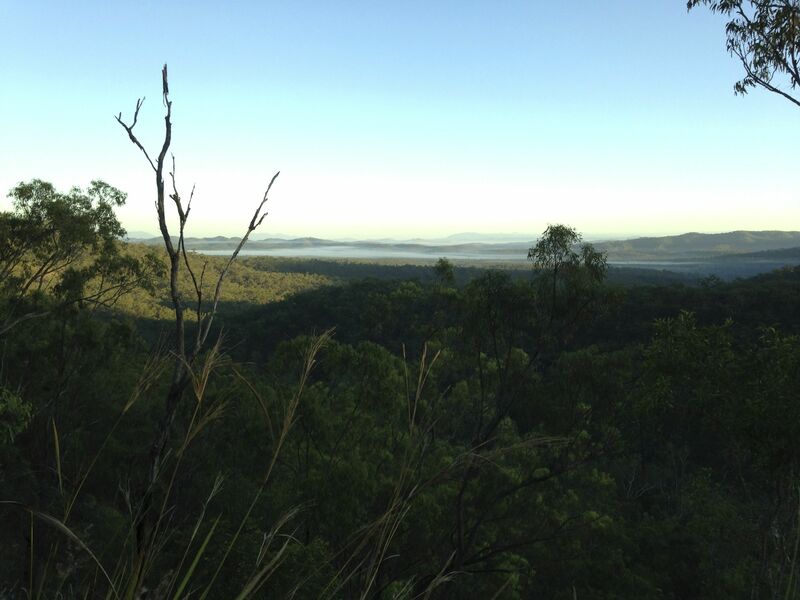 The field sites were on the Atherton Tableland, northern Queensland. Sites were in hilly, rocky areas, because we were trapping northern quolls (Dasyurus hallucatus), and they live in hilly, rocky habitats. 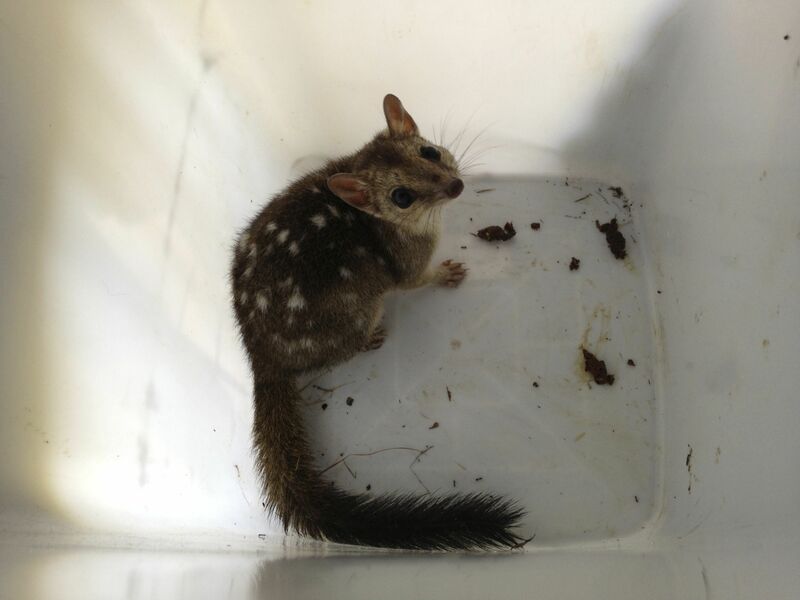 Northern quolls are classified as ‘endangered’ by the federal government, which was one reason why this fieldwork was done – a colleague was collecting samples for population genetics analysis. Live mammal trapping involves getting up before sunrise to check traps nice and early (so the animals don’t get caught in the sun! ), even though all our traps were covered with a thick layer of vegetation for protection. Walking around in the dawn light for the purposes of handling little marsupials is definitely one of those “I love my job” moments. Being at work at sunrise is not all bad. 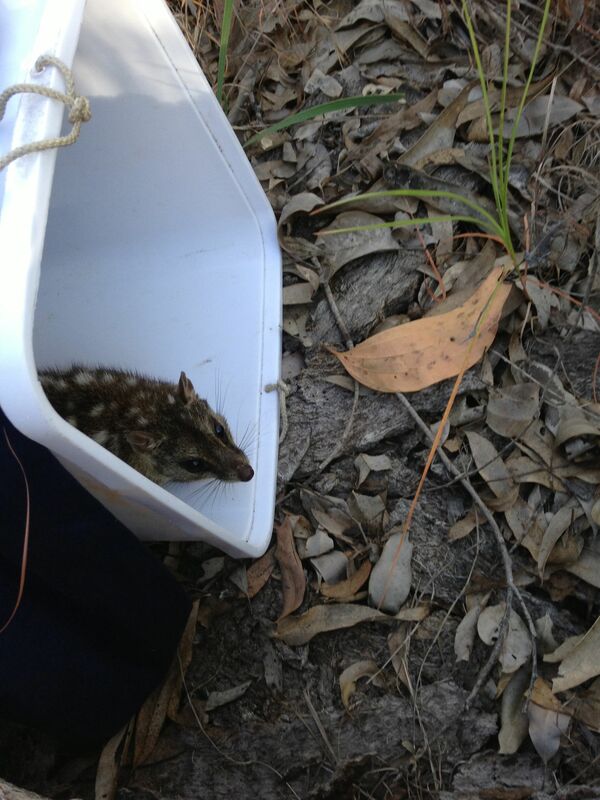 It turns out that northern quolls are pretty easy to catch. 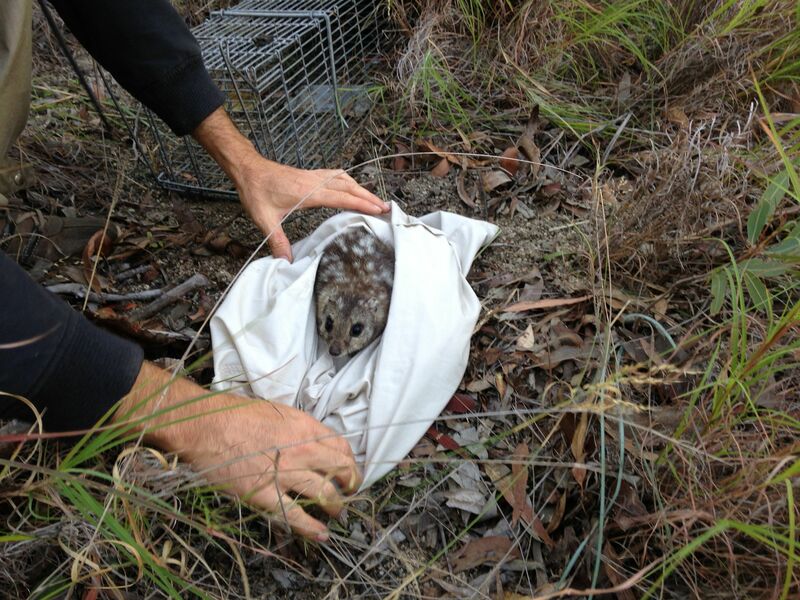 Using collapsible cage traps baited with chicken frames from the butcher, we caught ourselves many quolls. The traps were treadle-operated, meaning that there was a little flap on the floor attached to the door of the trap by a metal rod. As an animal steps on the flap on its way in to eat the bait, it dislodges the rod and the door swings down, trapping the animal. Northern quoll, Dasyurus hallucatus, in a bag. Once caught, the quolls get transferred to a handling bag where they had their measurements taken, and were examined for ectoparasites. Generally, they do not get checked for parasites, but because I was there, I collected any ectoparasites I found on each animal. 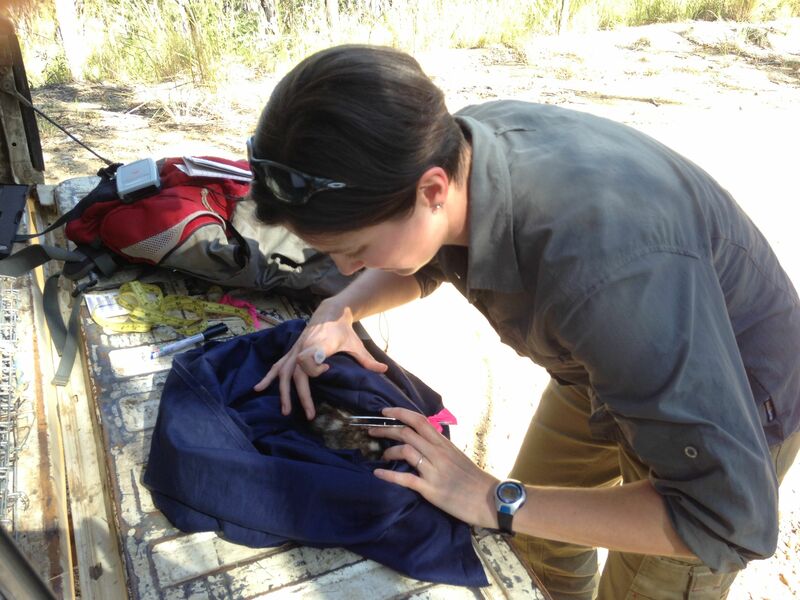 Me, collecting parasites from a quoll. Paydirt! 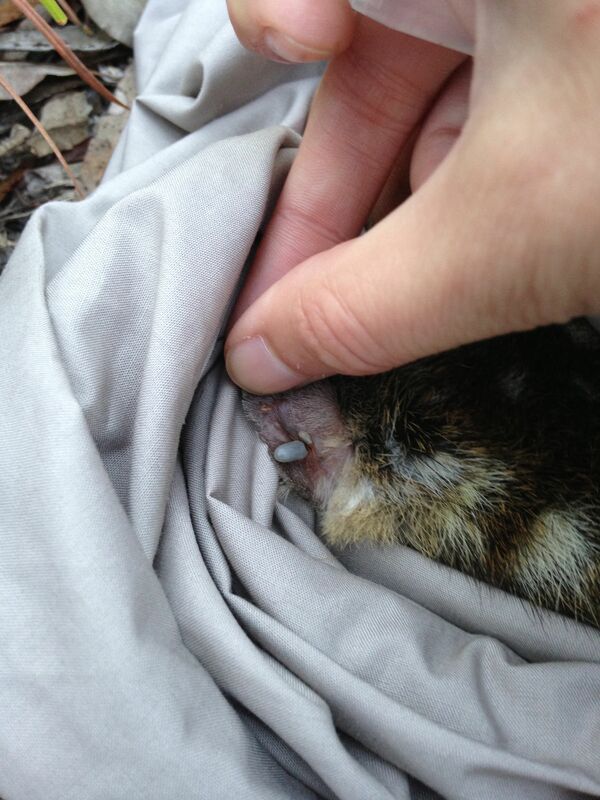 Ticks on the back of a quoll’s ear. After I’d finished picking at their ears and combing their fur (for fleas! ), they got their photo taken – in a kitchen garbage bin, no less. It was the best thing to show up their spots, and they couldn’t jump out of it. Usually. We did have a couple of escape attempts. The purpose of the photography was as an identification method for upcoming remote camera trapping, as quolls have individual spot patterns. Then, they were done, and released at the site of capture. 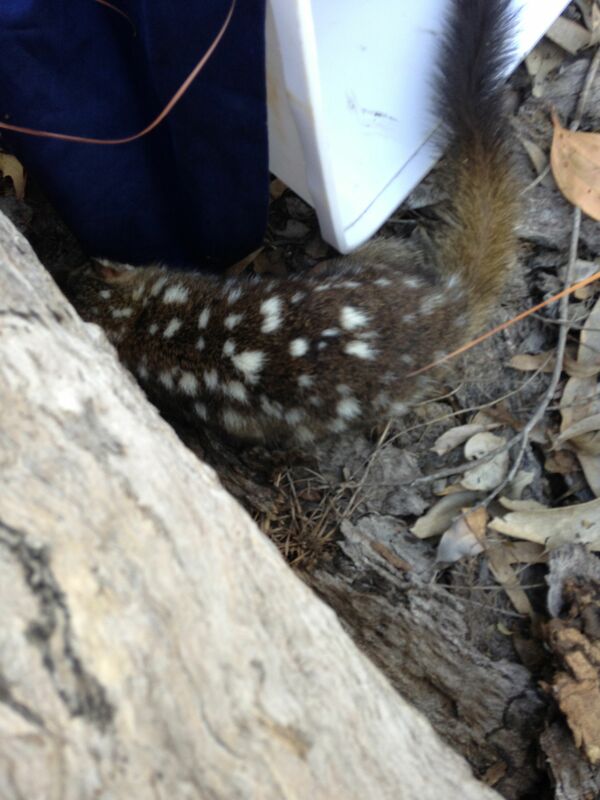 We caught several quolls again and again. Seems they didn’t mind the indignity of a night in a trap as long as they could have a chicken dinner! Quoll showing us its good side. 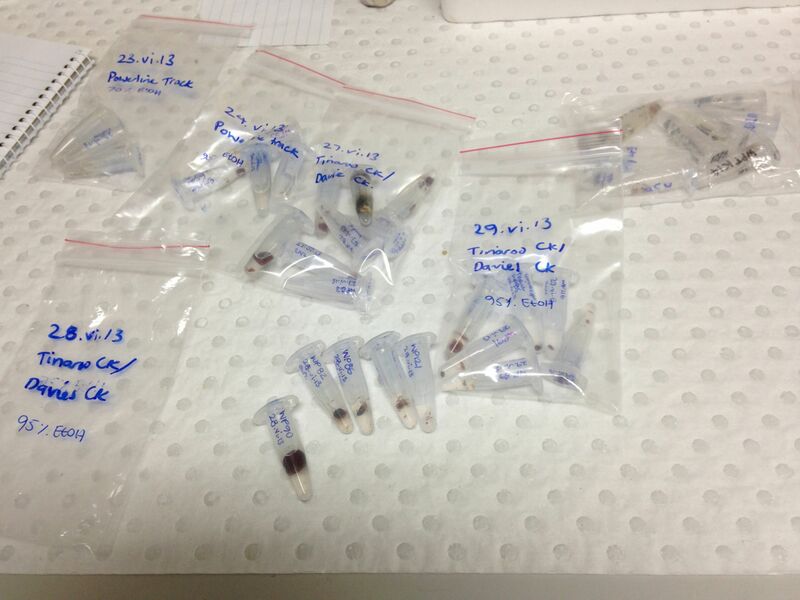 Back at the lab, I have a collection of ticks, mites, fleas and lice from the quolls that were captured. I sorted them into separate vials and am now going through the process of identifying them. Some are easier than others! Very little is known about the parasites of northern quolls, so my work will shed a bit more light on the ecology of parasites on an increasingly rare marsupial. Christmas came early in the parasite lab! Some journals now include a graphical abstract for works published (e.g., International Journal for Parasitology), where authors of papers provide a picture to represent their work. Making a video takes it a step further, and allows research to be more accessible, particularly for busy people, and interested people across all levels of scientific understanding. For example, reading the paper is probably beyond the comprehension of most school kids. But the video could make an important contribution to an environmental science class and help kids understand sophisticated concepts. Stop-motion animation may be beyond some people’s AV capabilities (me included! ), but a video narrated in plain English is a brilliant way to communicate science, and to get your science to reach more people. Do parasites really have a charm deficiency? While drafting yesterday’s post (which was my 150th for Increasing Disorder! ), I included some discussion about parasites being intentionally lost as part of conservation efforts for their hosts. While it didn’t make the final cut, it is worth talking about as further evidence that parasites are not on a level playing field for conservation. Do parasites really have a charm deficiency? Or is there something else going on? There is a perceptible degree of arrogance with regard to conservation of species – that some species are more equal than others. It won’t matter if some little worms are lost, as long as the cute fluffies are saved, right? Wrong. One way in which parasites can be lost is through translocation of their hosts. Translocation is a method used to counter loss of species. It is expected to be used more frequently in coming years as habitat loss, environmental perturbation and climate change affect populations of endangered species (Sainsbury & Vaughan-Higgins 2012). Translocation can be as simple as rounding up a number of individuals from one site and releasing them in another, but usually there are various holding periods where the individuals are kept in captivity to breed and increase the overall population size before being released. Translocated individuals could therefore potentially either lose parasites (or other pathogens, commensals or mutualists) or introduce parasites (or other pathogens, commensals or mutualists) into the new area. The former is of particular importance for plants, which often rely on certain invertebrates for pollination, or have invertebrates that rely on them for habitat (see Moir et al. 2012 for discussion on this). A famous case of parasites being lost via captive breeding is that of the louse Colpocephalum californici. It was intentionally removed (as part of a comprehensive de-parasite treatment) from its host, the critically endangered Californian condor (Gymnogyps californianus), when the last 22 known condors from the wild were brought into captivity (Mihalca et al. 2011, Colwell et al. 2012). However, while many lice are highly species-specific, it appears that there has been little study on the released condors, or any co-occurring related birds to examine whether the condor’s ectoparasites have managed to survive on other hosts (Colwell et al. 2012). Although there is evidence that endoparasites (such as nematodes or cestodes) do stand a greater chance of survival in a translocation event than ectoparasites (Moir et al. 2012); if all hosts held in captivity are treated with anthelmintic drugs to remove parasites, then they will most likely be lost anyway. This is bad if there are either no other wild hosts (e.g., the Californian condors), or if the parasite is not distributed evenly across the whole geographic range of the host. While the loss of parasites during captive breeding and translocation is bad for biodiversity, allowing parasites to travel with their hosts into the translocated area can cause problems too, by introducing new pathogens into wild populations. Parasites occurring in hosts being translocated may not occur in the population being supplemented. Or, translocated hosts may become a new host for an existing parasite/pathogen, increasing its presence in the environment. Such changes to host and parasite/pathogen balances can potentially cause outbreaks of disease, or could intensify the infection rate disease in the translocated naïve population (Sainsbury & Vaughan-Higgins 2012). It is critical that an adequate understanding of the parasites, pathogens, commensals and mutualists is required for any translocation or captive breeding to succeed. Interestingly, however, captive breeding programs are often subject to human intervention and interaction on a number of direct and indirect levels. In a recent study, it was found that captive breeding of brush-tailed rock wallabies (Petrogale penicillata) appeared to have conferred a degree of antibiotic resistance in their gut bacteria, via inclusion of mobile genetic elements (integrons) of bacteria (Power et al. 2013). Such integrons were absent in bacteria from wild populations, indicating that the gut flora of the wallabies acquired them during their time in captivity (Power et al. 2013). There are obviously many elements to consider when making large steps towards conservation in form of species translocation. Parasites (and commensals and mutualists) are an essential – and immense – component of healthy ecosystems, and there is still much to learn about their role in regulating ecosystem function (Dobson et al. 2008). They should not be ignored when decisions on conservation are being made for their larger, more charismatic (and charming?) hosts. Colwell, R et al. (2012) Coextinction and persistence of dependent species in a changing world. Ann. Rev. Eco. Evol. Syst. 43, 183-203. Dobson A et al. (2008) Homage to Linnaeus: How many parasites? How many hosts? PNAS 105, 11482-11489. Mihalca, AD et al. (2011) Coendangered hard-ticks: threatened or threatening? Parasites & Vectors 4:71. Moir, ML et al. (2012) Considering extinction of dependent species during translocation, ex situ conservation and assisted migration of threatened hosts. Cons. Biol. 26, 199-207. Power, ML et al. (2013) Into the wild: dissemination of antibiotic resistance determinants via a species recovery program. Plos One 8, e63017. Sainsbury, AW & Vaughan-Higgins, RJ (2012) Analyzing disease risks associated with translocations. Cons. Biol. 26, 442-452. Parasites: the Cinderellas of wildlife conservation. Think of an endangered animal. What’s the first one that pops into your head? Chances are it was something large, charismatic, and probably a mammal – and it’s fairly safe to say that you didn’t think of a louse or a cestode. 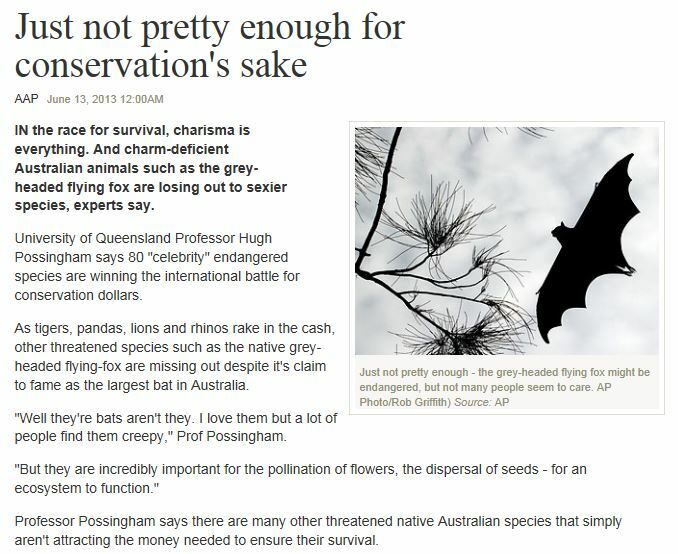 Spied in the news, (The Australian newspaper, screenshot below) an article laments that many of Australia’s endangered species are “charm-deficient”. One result of this perceived deficiency is that dollars going towards conservation programs seem to go to more charismatic and exotic species like pandas, tigers, elephants etc. The grey-headed flying fox is mentioned in the article as one such uncharming native species. It is Australia’s biggest bat, and it’s listed as vulnerable (ref: http://www.environment.gov.au/cgi-bin/sprat/public/publicspecies.pl?taxon_id=186). Apparently, many people don’t like bats, so it stands to reason that they might not want to donate money to save a species they do not like. Excerpt screenshot of the article, The Australian 13 June 2013. While this is distressing for the 94 species of mammals currently listed as vulnerable, endangered or critically endangered nationally in Australia, perhaps a thought can be spared for some even more charm-deficient animals: parasites. Not only are they almost always absent from lists of threatened species (there are a few notable exceptions), they generally suffer from an image problem. Most people like parasites far less than they like bats. So what’s a parasite to do, in order to get attention for conservation? There is currently only one species of parasite listed on the IUCN Red List. The louse, Haematopinus oliveri, is listed as critically endangered but only because its host, the pygmy hog (Porcula salvania), is critically endangered (Dunn et al. 2009). In Australia, only one parasite species is listed as endangered, and it isn’t even at national level. The tapeworm Dasyurotaenia robusta has been listed as rare under the Tasmanian Threatened Species Protection Act, because it has only been found once, in one host, the Tasmanian devil (Sarcophilus harrisii). Many parasite species have been described from endangered host species. Two such examples are the louse Felicola isidoroi was described from the Iberian lynx (Lynx pardinus) (Perez & Palma 2001); and the protozoan Caryosprora durelli was described from the Round Island boa (Casarea dussumeiri) (Daszak et al. 2011). Depiction of H. oliveri (via Wikipedia). The concept of coextinction (parasites, mutualists and commensals becoming extinct alongside their hosts) has been around since the 1990s. Parasites are integral parts of ecosystems, and their richness in a given system will decline as the free-living species are lost (Lafferty 2012). A problem with estimating parasite biodiversity is aggregation, where parasites are not distributed in a uniform manner across a host population. This means that as hosts are sampled, parasites can be missed, reducing or skewing the overall snapshot of complete parasite biodiversity of the given host. We may never know how many parasites are endangered because we will probably never be able to find them all before they (and their hosts) go extinct (Dobson et al. 2008). D. robusta – 1) Scolex with rostellum retracted (scale 1.0mm), 2) Rostellar hooks (scale 0.1mm). From Beveridge 1984. To complicate matters, some parasites are generalists, and can infect a range of host species, whereas some are highly species-specific. The generalists may be able to survive a host extinction event by switching to a new host, but the species-specific parasites will most likely not survive if their host, or their intermediate host, dies out. However, one thing remains constant: parasites (and to an extent, other invertebrates) do not feature as highly on the conservation agenda as they should. For all the talk about ‘conserving biodiversity’, it seems remarkably narrow-minded to exclude an entire element of the biodiversity in question. We know parasites are at risk of coextinction. There is a growing body of research providing evidence for this (some nice reviews on the topic include Dunn et al. 2009, Mihalca et al. 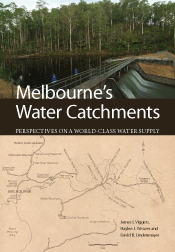 2011, Colwell et al. 2012 and Lafferty 2012), but still parasites are treated like Cinderella. 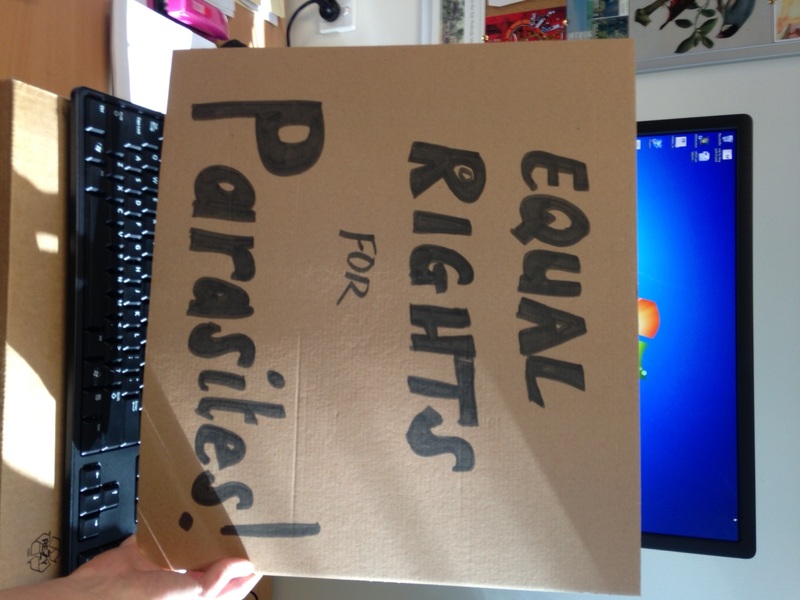 The phrase “equal rights for parasites” was coined by Windsor in 1990, and it is probably more relevant now than ever in light of our growing understanding of coextinction risk. Perhaps when compared to the intestinal helminths they harbour, the flying foxes aren’t so uncharming after all. Beveridge, I (1984) Dasyurotaenia robusta Beddard, 1912, and D. dasyuri sp. nov., from carnivorous Australian marsupials. Trans. R. Soc. S.A. 108, 185-195. Daszak, P et al. (2011) A new species of Caryospora Leger, 1094 (Apicomplexa: Eimeriidae) from the endangered Round Island boa Casarea dussumieri (Schlegel) (Serpentes: Bolyeridae) of Round Island, Mauritius: an endangered parasite? Sys. Parasitol. 78, 117-122. Dunn, RR et al. (2009) The sixth mass coextinction: are most endangered species parasites and mutualists? Proc. R. Soc. B. 276, 3037-3045. Lafferty, K (2012) Biodiversity loss decreases parasite diversity: theory and patterns. Phil. Trans. R. Soc. B 367, 2814-2827. Perez, JM & Palma RL. (2001) A new species of Felicola (Phthiraptera: Trichodectidae) from the endangered Iberian lynx: another reason to ensure its survival. Biodiver. Cons. 10, 929-937. Windsor DA (1990) Heavenly hosts. Nature 348, 104.